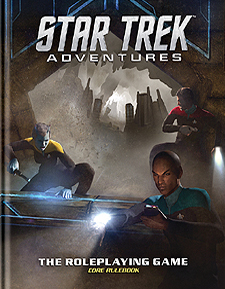 Star Trek Adventures takes you to the Final Frontier of the Galaxy, where new discoveries await keen explorers of Starfleet. Your duties may take you to the edges of known space, or to Federation colonies in need, to the borders of neighbouring galactic powers or into the eye of interstellar phenomena. Your ship and your crew epitomize the best Starfleet and the United Federation of Planets has to offer, and you are needed more than ever. A new threat looms from across the Gamma Quadrant, as it is confirmed by Commander Sisko and his crew that the dominion, led by the Founders, represent a significant threat to the Alpha Quadrant. Tension is already high in the region of Bajor and Deep Space 9, as the Maquis continue to act against the Cardassian-Federation peace treaty, with Captain Janeway and the crew of the USS Voyager preparing for their mission in the Badlands. It is a volatile time for the Federation and new crews have never been in higher demand. Create your own Star Trek stories of discovery and adventure on the final frontier. Complete 2d20 game system adapted for Star Trek Adventures. An extensive exploration of the United Federation of Planets and its galactic neighbours in the Alpha, Beta and Gamma Quadrants. Guidelines for Gamemasters old and new, on how to run an adventure of exploration and discovery for the crew of a Federation starship. A full catalogue of aliens and antagonists including Klingons, Romulans, Cardassians, the Borg, and the Dominion. Brought to you by a team of expert Star Trek writers including writers from previous editions of Star Trek roleplaying games and other gaming talent. Personal logs and intercepted communications by Starfleet Intelligence provide a new perspective on Star Trek and its events.